It’s a well-established architectural concept that introducing contemporary designs into old structures generates a visually and texturally rich building: the juxtaposition between the old and new. However, for this to work successfully it’s important to have a clear understanding of what gives the existing structure its character – what is the dialogue between the old and new trying to communicate? 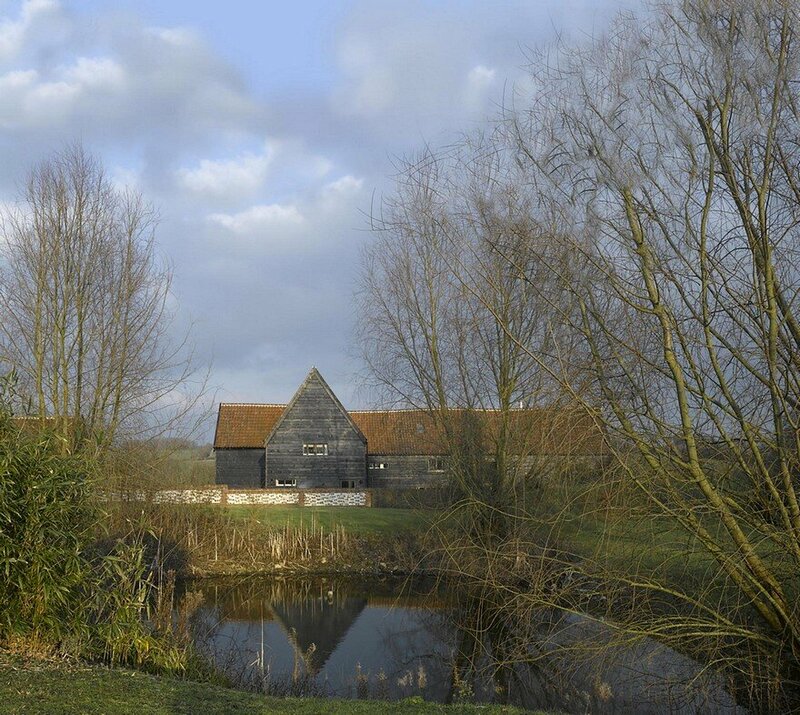 Chantry Farm Barn is a Grade II listed timber framed barn in Suffolk that had been left redundant and was beginning to fall into disrepair. 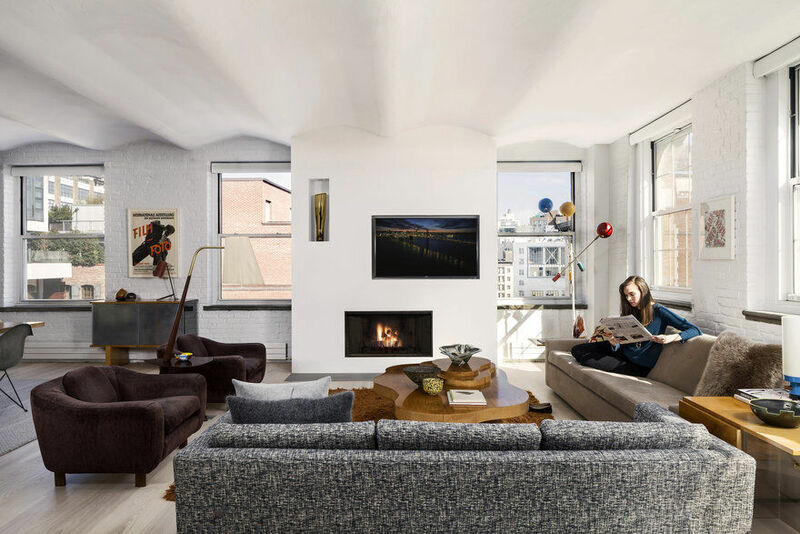 The owners of the building, Alan and Laura Jarvis and their daughter Holly, wanted a conversion that kept the character but was contemporary. 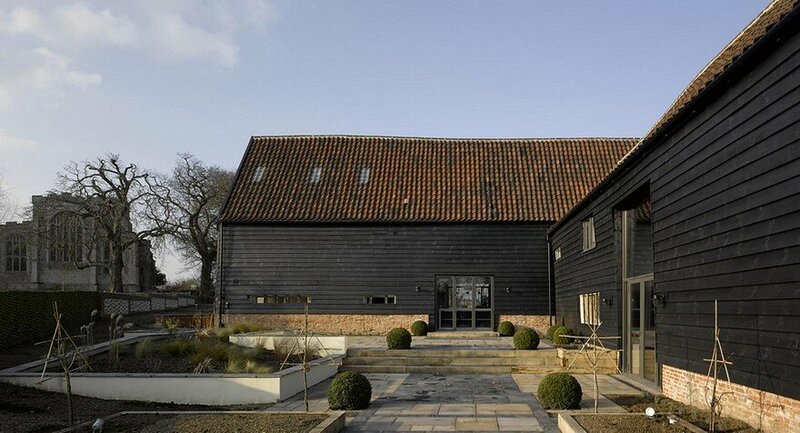 Part of a bucolic setting of farmhouse, church and barn, it presented quite an imposing black timber clad structure set at the point the land slopes away to the fields beyond. 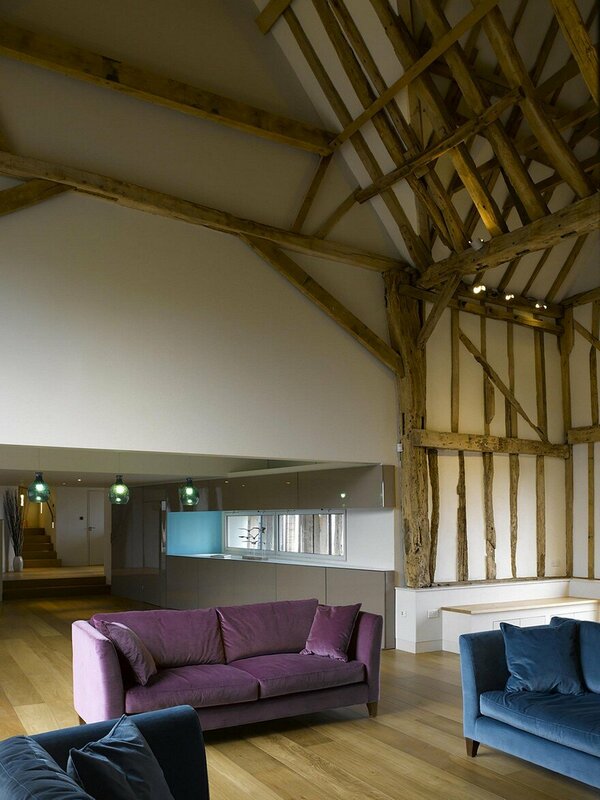 The original 17th Century barn had been extended over the course of time to become two large barns set perpendicular and at different levels to one another and the low brick plinth walls had been repaired roughly, typically of a working agricultural building. 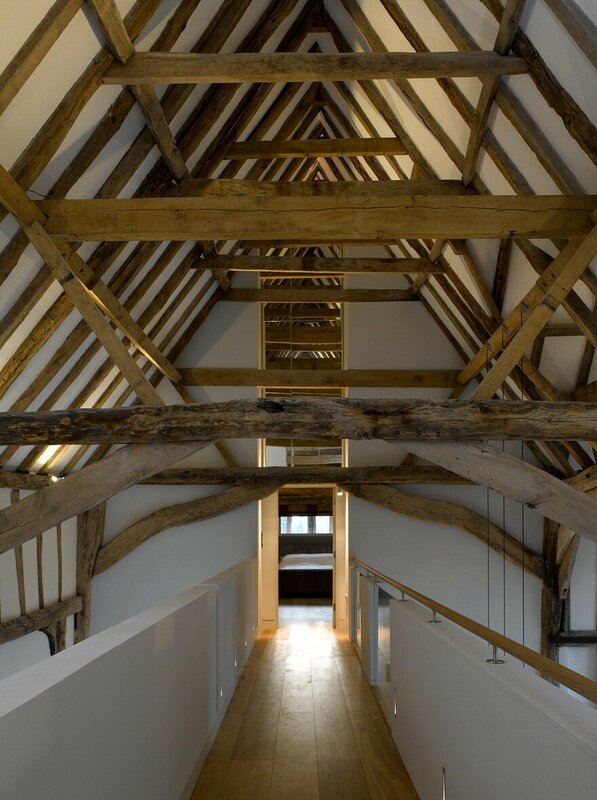 Internally the original timber frame was generally sound and its lack of external openings created a real sense of enclosure and protection from the cold easterly winds. 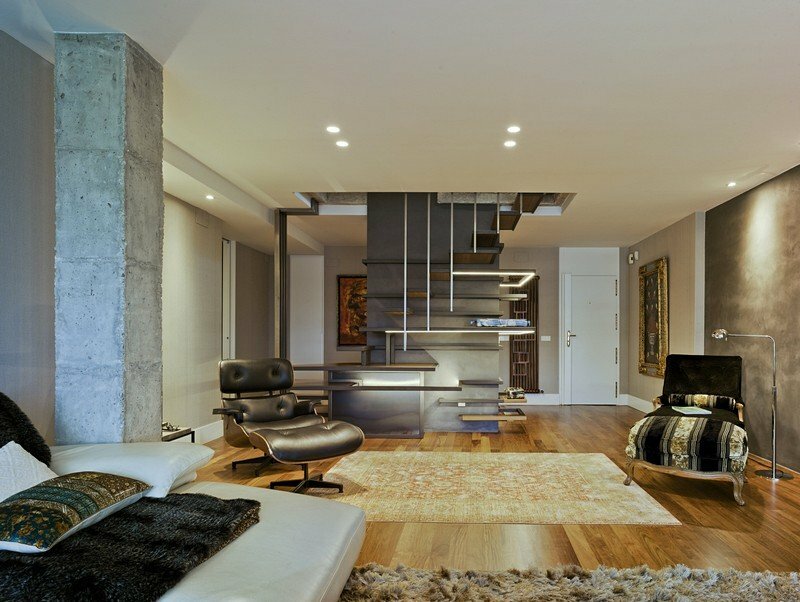 The key character was its rough functional nature with large simple internal volumes. 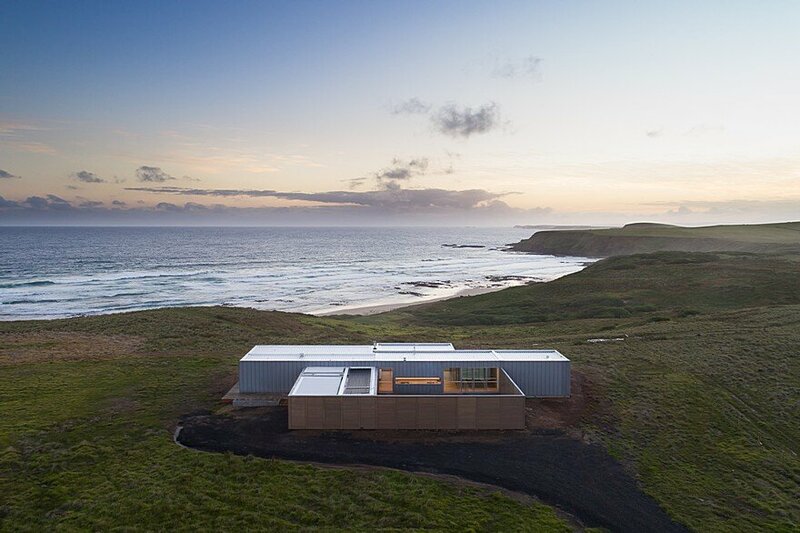 The trick was to somehow create the human-scaled spaces for a family home yet retain the sense of it as a ‘barn’. 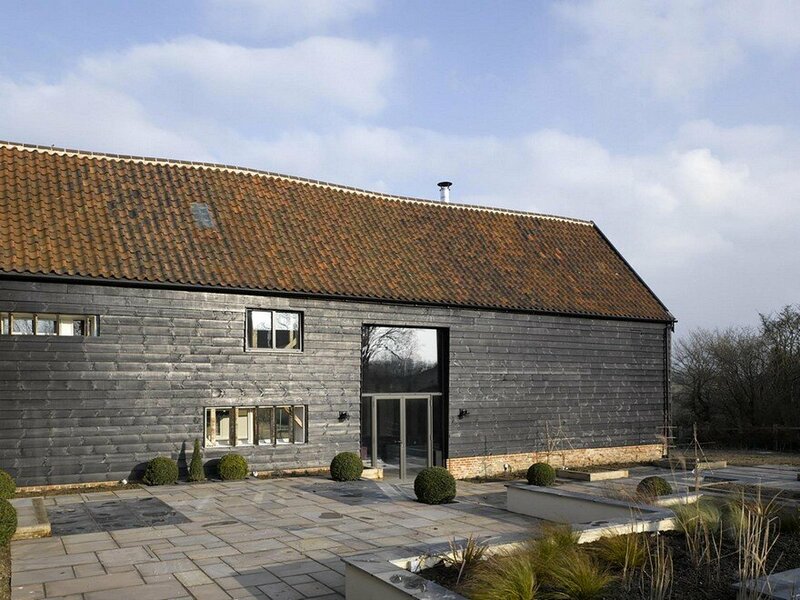 Externally, the idea was tochange the existing appearance of the barn as little as possible: the recent single storey lean-to extension to the barn was removed and a new single storey extension added to create a new entrance: the only significant modification to the barn. Other than that, insulation was added and the timber boarding was replaced, the roof re-tiled and the plinth walls left as undisturbed as possible. 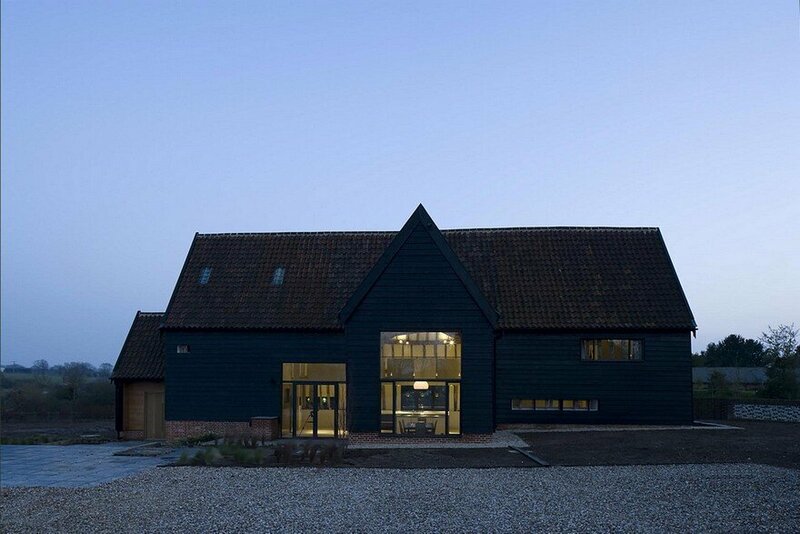 Existing openings are retained and the number of new windows minimised to avoid the ‘domestication’ of the building so that the barn reads as a ‘barn’, rather than a house. 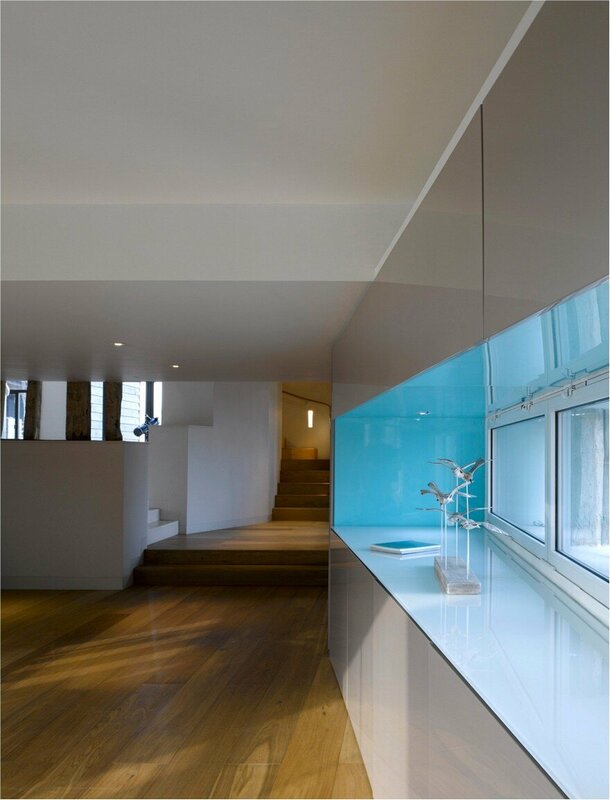 Rooflights areconcealed behind reclaimed glass pantilesand some of the new windows are concealedbehind glass slats that continue the lines of the external timber boarding. 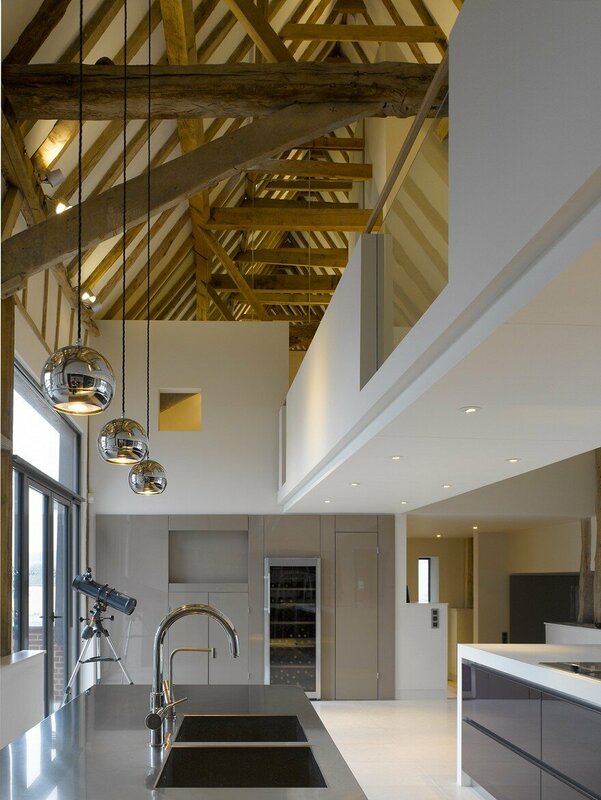 Entering the barn however reveals a completely different contemporary character. 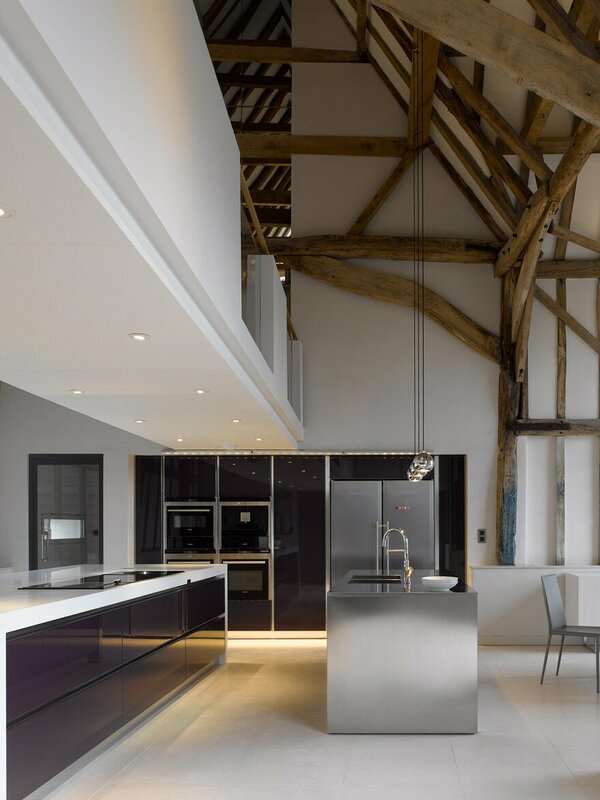 Two large full height volumes, one to each barn, display the full extent of the historic timber frame, with all its irregularities, markingsand worn textureexposed against the clean light and smooth surfaces of the new plasterboarded walls and ceilings. 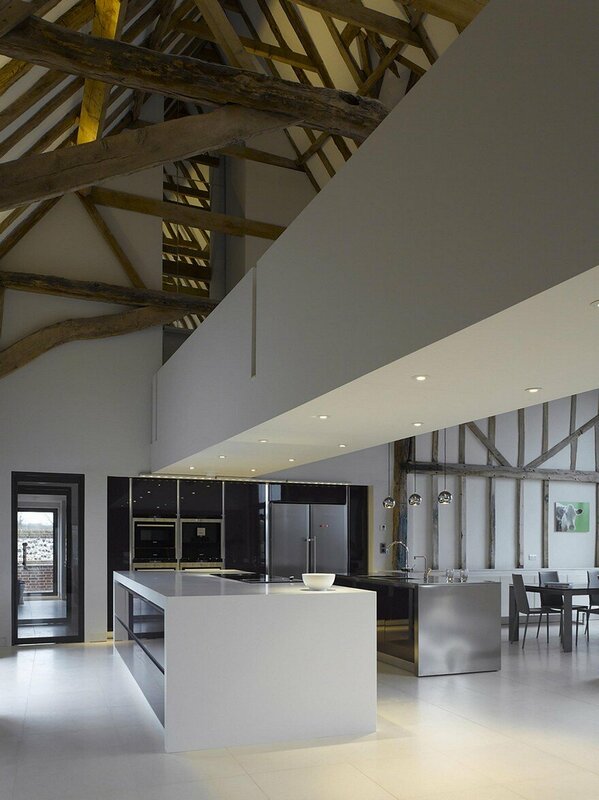 In the first of these, the Upper Barn containing the kitchen and family dining area, there is a long elegant bridge leading to the master bedroom spanning across and hovering above the kitchen island units. 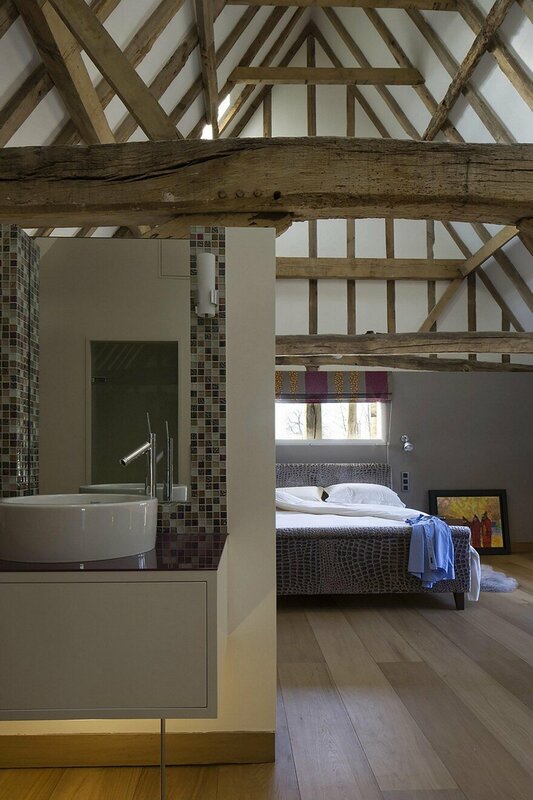 St high level mirrors reflect the roof structure to re-create a wonderful sense of the original volume. 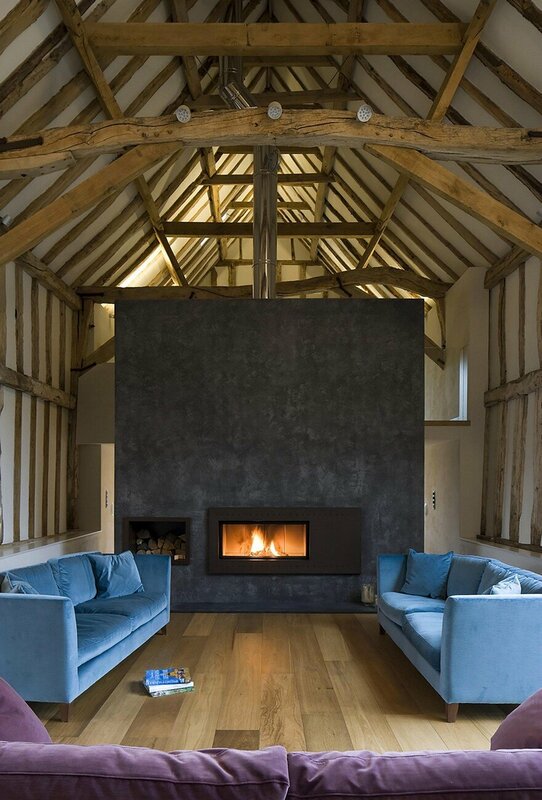 An angled wall with highly glossed panels leads you down into the Lower Barn to the second full height volume with the sitting room and then through to the new free-standing fireplace wall with it’s dark grey polished plaster that feels strangely like velvet to the touch. Both of these two volumes have the original projecting bays with newlarge glazed screens to each elevation set within the existing openings (one side high, one side low) typical of Suffolkthreshing barns. 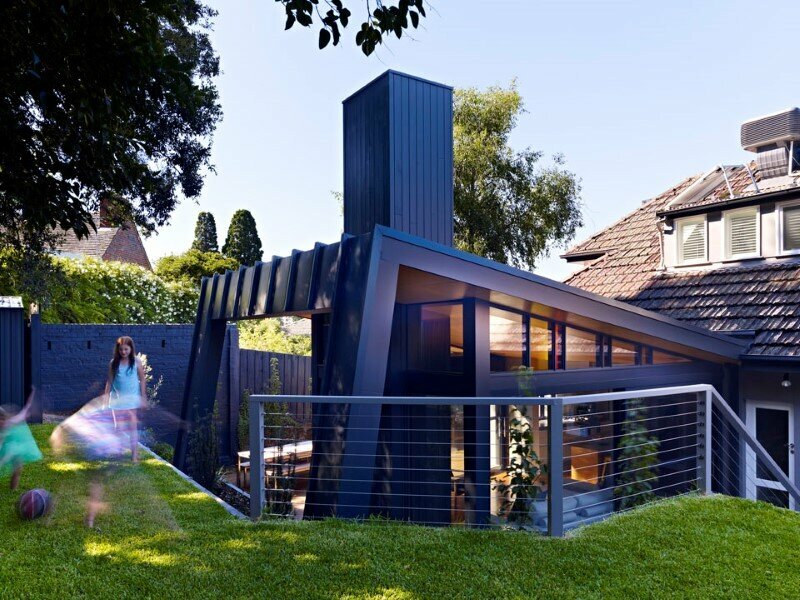 The walkway and the fireplace not only provide clear orientation to the open plan layout but also respond to the scale of the volume and continue the narrative between the existing and new. 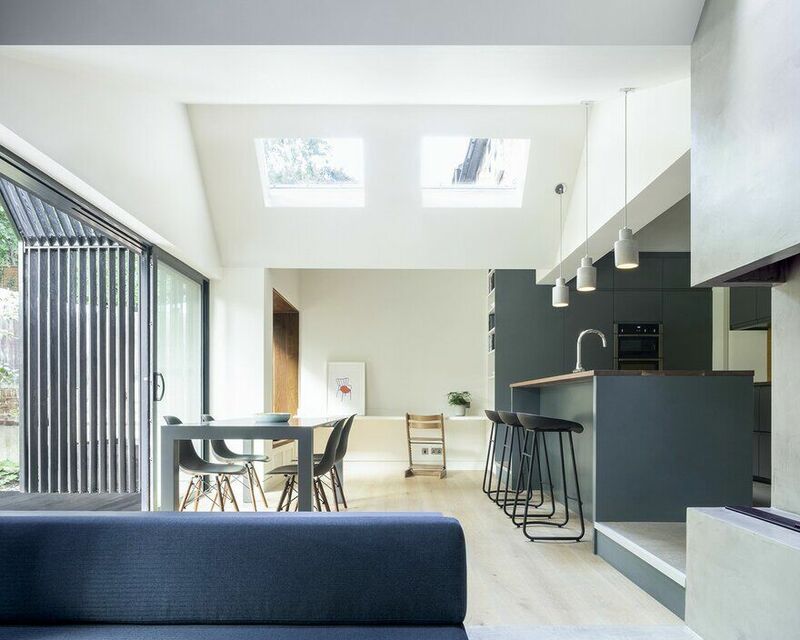 To heighten the drama of these volumes the timber framing to the walls and the plinth is hidden in the single storey areas, a strategy also prevent these becoming too ‘busy’ visually. 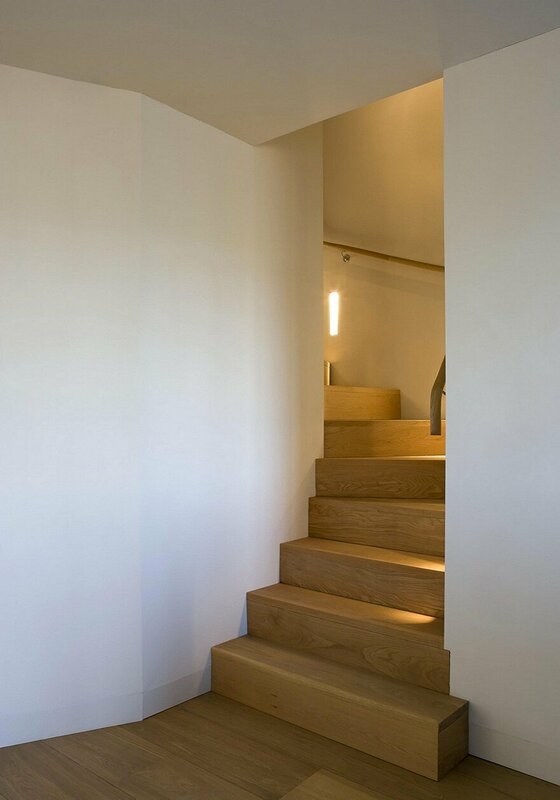 Two winding oak staircases lead from the entrance hall up to the bedrooms: one for the family and the other for guests. 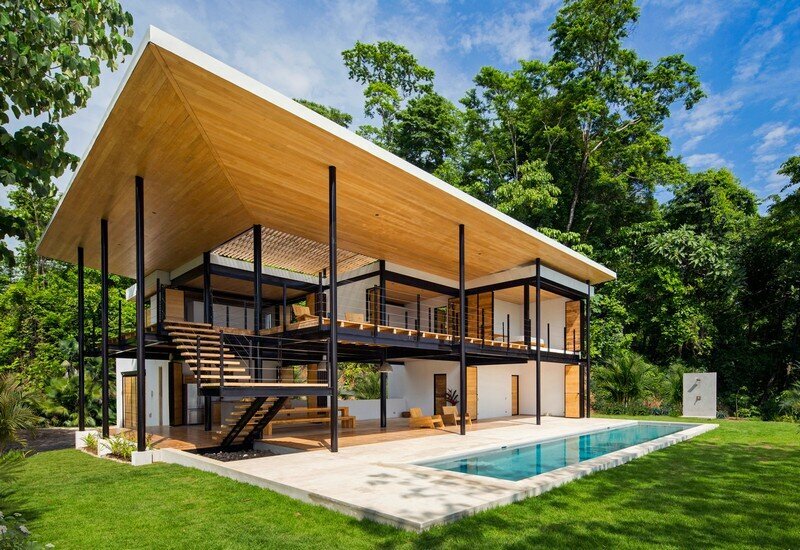 The walls of these roomsare also lined but the roof structure is left clear to soar above the spacesutilising the drama of the structure but on a more intimate scale. Clear lines of sight right through the building help to strengthen the sense of the single volume and carefully positioned windows extend these further to give a light and airy feel with a good connection to the world outside. The construction details were developed both to be fully breathable, to preserve the longevity of the existing timber structure, and to emphasise our design strategy to create a narrative between old and new: the straight and plumb frames of the modern aluminium windows are deliberately set clear of the uneven and raw existing framing. The straight back edge of the sill board to the plinth is kept clear of the existing wall-plate highlighting its irregular edge and simplifying the construction process: it would have been a difficult job to trim the boards to follow the existing timber and the distinction between old and new would have been weakened. 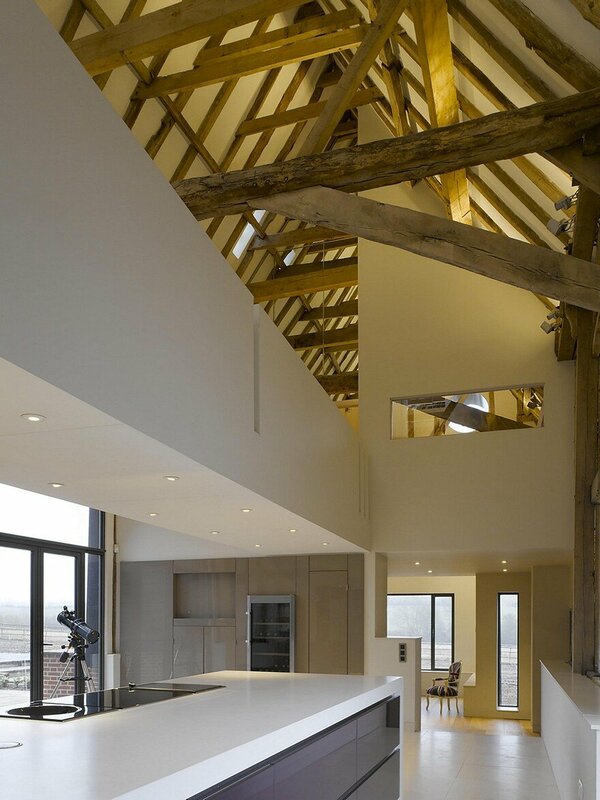 The finish of the timber frame is left rough and un-touch contrasting against the even textures of the lime plaster, the smooth highly glossed panels and plinth sills, and the monolithic appearance of the limestone flooring. 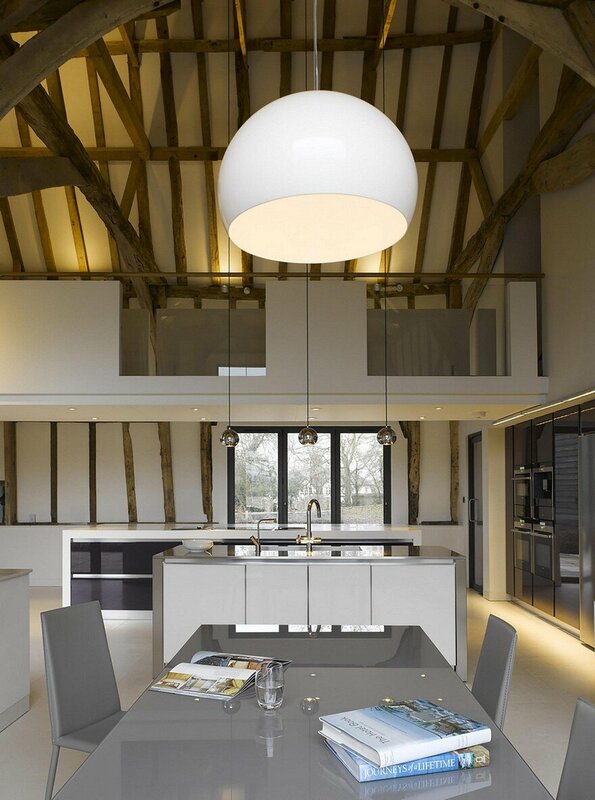 At Chantry Farm Barn a historically significant building has been sympathetically converted into a contemporary home. The “old vs new” concept works particularly well here because of three key decisions: to contrast the inside from the outside appearance,to not just retain but to exploit the large volume within the building, and by emphasising the texture of the historic timber frame with careful detailing and specification of materials. Building Contractor who took over: Hartog Hatton Ltd. Structural Engineer: Stroud Associates Ltd. Quantity Surveyor: Andrew Morton Associates Ltd.